I’m very excited (and proud) to announce that on March 3rd, 2016 I reached a long-term goal I set for myself 3½ years ago, by self-publishing my first book, The Linux Sysadmin’s Guide to Virtual Disks. The book is published under my new brand, Scribe’s Guides. The first edition of The Virtual Disk Guide has been a long time coming. Nearly 7 years of on-and-off writing have gone into it. I’m relieved to have made it this far. 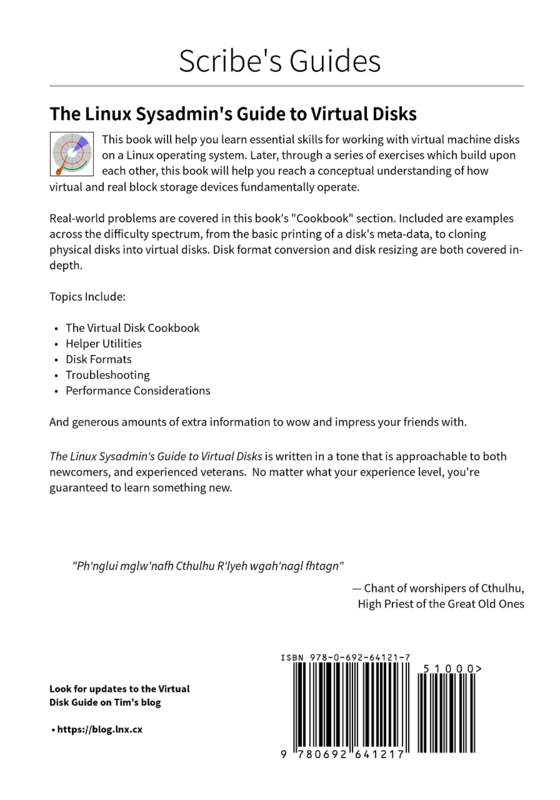 I view the book as the definitive reference guide for virtual disk related activities — clear, concise, accurate, and approachable to readers of all skill levels— but that’s just my opinion. You can decide that for yourself. 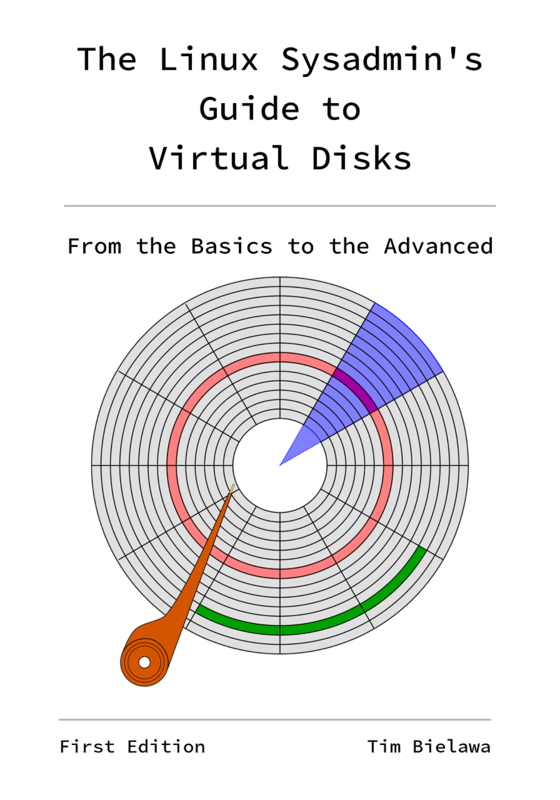 The Linux Sysadmin’s Guide to Virtual Disks demonstrates the core concepts of virtual disk management. Real-world problems are covered in the book’s “Cookbook” section. Other topics include: helper utilities, disk formats, troubleshooting tips, performance considerations, and comprehensive appendices. Or do both! Say “thanks!” by purchasing a copy, and then enjoy the latest builds online forever, for free! The official publishing of The Virtual Disk Guide does not change anything about it’s openness or your freedom to remix it however you wish. The book is still freely licensed under the Creative Commons Attribution-ShareAlike 4.0 International License (CC BY-SA 4.0). All of the source material used to build the book’s body material and cover images are still free and open source, covered under the same license. All digital media displayed in the book, such as figures and the cover art, was created using free/open source software. Each media item was created and saved in digital formats unencumbered by patents. As ever, if you identify errors in the book or have thought of a way to improve it, please open a ticket on the GitHub issue tracker. If you’ve read a copy of the book already and would like to contribute a review or statement, feel free to reach out to me. Find my email in a github commit, or look at my other contact methods under the author highlight panel on scribesguides.com. The experience of writing and publishing this book has taught me much, and it’s time to spread that information. Check back soon for a follow-up post I’m writing which covers more of the technical side of self-publishing. Specifically, self-publishing a DocBook 5 document at the on-demand printing website lulu.com. Let me be explicitly clear, this is not a promotion for lulu.com. Rather, the post will review some of the technical challenges I encountered (old examples: #1, #2, #3) during the publishing process, including challenges specific to Lulu. Such as, how I customized the PDF output from dblatex to look more personal and less generically academic, why I had to order three proof copies of the book before the cover matter printed in decent quality, and how to adjust your inner and outer page margins so there’s a reasonable amount of whitespace between the spine/binding and the body text. Back in late 2013 I joined what was jokingly referred to as the Red Hat IT “DevOps” team. We didn’t like that name, so we changed it and there-after became officially known as Team Inception. From the time the team was formed, we all accepted that the team was to retire in 18-24 months. We were totally cool with that too! To us having a pure “DevOps” team in perpetuity just didn’t make sense. The Ansible XML module. This grew in popularity so much that we realized the best way to ensure it lives on was by transferring complete ownership over to Chris Prescott, a former contributor (Thanks Chris)! Two week ago (2015-06-20 → 2015-06-24) the DevNation and Red Hat Summit 2015 conferences were held in Boston, MA. Of the many excellent speakers and panel groups [S|D] that held sessions during the conferences, there’s one group I am especially fond of: My old team, Inception. On Wednesday, July 24th we held a panel session called Bootstrapping a DevOps Movement in Red Hat IT. This was our final activity together as Team Inception. During this panel-style session Jen Krieger, our Product Owner/Scrum Master, facilitated a look back at some of our experiences during our 18 months as the Red Hat IT “DevOp Team”. We began the initial round of questions with what our individual perceptions of “DevOps” were before the team had formed. We followed that with what ended up being a great Q&A with the audience (thank you everyone who participated!). We ended the panel with our closing thoughts on what “DevOps” means to each of us now. What we accomplished. We’ll take you step-by-step through how we deliver our work using a combination of open source tools, including Docker. How we rate both our cultural and tooling success. Roadblocks, disruptions, and surprises we encountered and how we handled them. How this project has changed the way we view our jobs and our work relationships. What’s next for the team. Between ourselves, we casually referred to this as our final team retrospective, an honest (and very public) look-back at lessons learned over the last year and a half. Click play below to watch the full video now, or go directly to it on YouTube. And before I forget. So much thanks to Andrew “Hoss” Butcher [GH] for recording, editing, and posting the recording for us. I (we) owe you many Tasty Beverages for that.